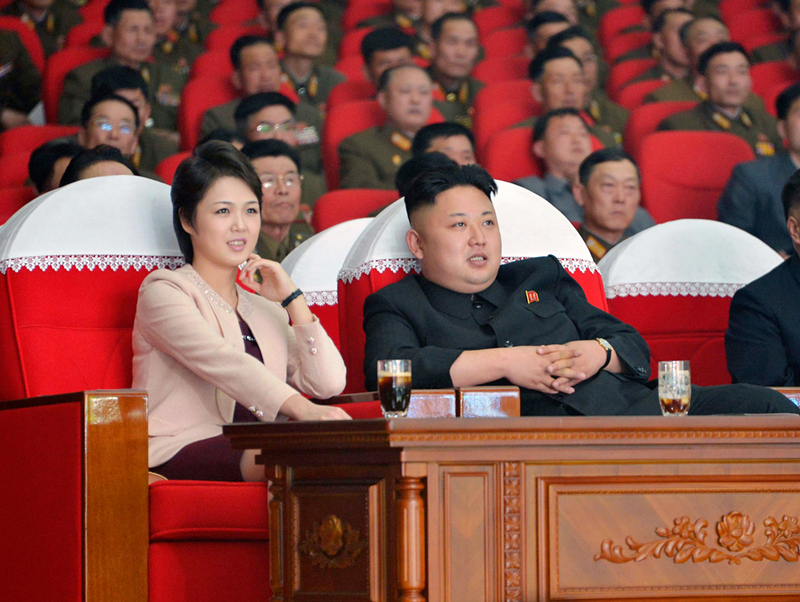 North Korean leader Kim Jong Un and his wife Ri Sol Ju watch a performance by the Moranbong Band at the April 25 House of Culture in this undated photo released by North Korea's Korean Central News Agency (KCNA) in Pyongyang on March 24, 2014. Russian interests such as coal exports from North Korea and the Rajin-Khasan joint trade logistics project will not be affected the punitive sanctions on Pyongyang. The United Nations Security Council on March 2 approved a plan to impose sanctions on North Korea for its nuclear tests and rocket launch, after Russia backed a joint resolution introduced by the U.S. and China and co-sponsored by 55 countries. Under the resolution, countries are required to ban all weapons sales to North Korea, and restrict all revenues to Pyongyang except for humanitarian purposes. The resolution also makes it mandatory for countries to inspect all cargo to and from North Korea, as well as cut off supplies of aviation and rocket fuel. In addition, countries have to expel North Korean diplomats who are affiliated with the nuclear program. The resolution, which was delayed because Russia said it needed more time, was watered down by Moscow. On Russia’s insistence, the resolution has provisions that allow aviation fuel for civilian aircraft of international carriers that fly to North Korea. The resolution also allows North Korea to export coal and minerals for livelihood revenues. The Wall Street Journal reported that Moscow negotiated the removal the Russia-based representative of the Korea Mining Development Trading Corporation from the list of sanctioned individuals. The U.S. Treasury Department has said that the corporation is a state-owned entity involved in arms dealing, according to the paper. Russia’s Permanent Representative to the United Nations Vitaly Churkin told TASS that Moscow has managed to protect its economic interests while agreeing to the sanctions. The Rajin-Khasan joint trade logistics project with North Korea would not be affected by the sanctions, Churkin told the news agency. The UN sanctions were imposed in the wake of North Korea’s latest nuclear test and rocket launch, which defied a ban on all nuclear-related activity.